iStateSoft Auto Manager is fully-rebrandable and easy-to-use vehicle management software, which was designed with car dealer's needs in mind. With it, auto dealers have full control over their inventory of vehicles (cars, trucks, boats, motorcycles, etc). 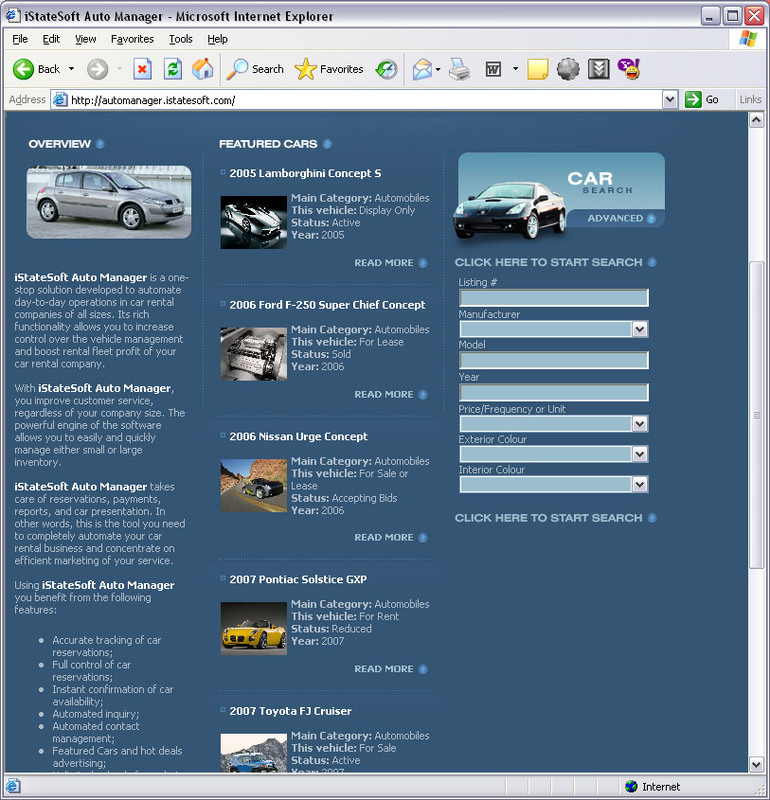 iStateSoft Auto Manager is easy-to-merge with existing web sites, which makes it flexible enough. It automates the whole car rental process, thus making dealers life easier. ...... iStateSoft Auto Manager takes care of reservations, payments, reports, and car presentation. In other words, this is the tool you need to completely automate your car rental business and concentrate on efficient marketing of your service. Qweas is providing links to iStateSoft Auto Manager 2.0 as a courtesy, and makes no representations regarding iStateSoft Auto Manager or any other applications or any information related thereto. Any questions, complaints or claims regarding this application iStateSoft Auto Manager 2.0 must be directed to the appropriate software vendor. You may click the publisher link of iStateSoft Auto Manager on the top of this page to get more details about the vendor.